JUVENILE EURYPTERID TAIL - SILURIAN SCOTLAND. 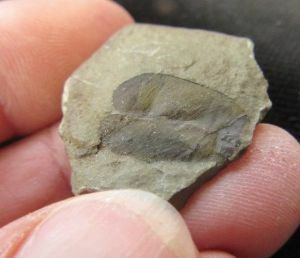 JUVENILE EURYPTERID TAIL - SILURIAN, SCOTLAND. Small piece of matrix. On one surface are two articulated lozenge shaped fossils. These are the bilobed tail from a juvenile Eurypterid or 'sea scorpion'. Unusual and difficult to obtain these days as most of the Eurypterid sites around Lesmahagow are protected with SSSI status and all collecting prohibited. Old collection piece from a non SSSI. Silurian, Wenlockian, Priesthill Group. Dunside Formation. Stream on east flank of Grouse hill, Lesmahagow, Lanarkshire, Scotland. tail : 1.5 x 0.9 cm.